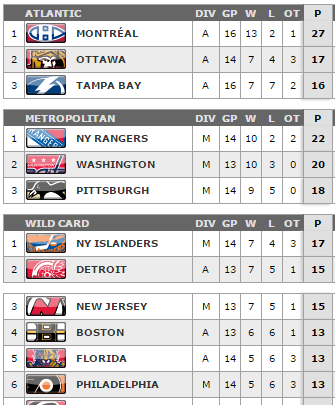 From a standings perspective, you have to be happy as a Sens fan. The team is currently 2nd in the Atlantic and holding a playoff position. Unfortunately, that’s about where most of the positivity has to end. The team only has 4 ROWs (regulation or overtime wins). The next team with that many in the East is the Philadelphia Flyers who are 6th in the wild card race. The Ottawa Senators have had an inability to finish games in regulation, as seen by their league leading number of shootouts, as well as late collapses against the New Jersey Devils (Oct 22nd) and the Carolina Hurricanes (Nov 7th). If this trend continues, the team is going to find itself out of a playoff position sooner than later. Here’s a graph made by @Wham_City in 2013. I’ve added a dot representing where the Sens are right now. It’s not good. So my prediction of Jared Cowen having a solid season is going “great” so far. Trying to spin the pairing of him and Mark Borowiecki as anything but bad is impossible. Courtesy of @MannyElk‘s new site we can see that the 2-74 pairing is by far the worst on the team when it comes to CF% at 5v5. In fact, of all the defensive pairings in the NHL to play over 100 minutes, this is the worst one. So the 2-74 pairing isn’t great at 5v5, at least they can penalty kill right? Well you’d think so, but the numbers don’t support it so far. The Ottawa Senators are currently 28th in PK% at 75.5% and when it comes to CA60 when 4v5, both Borowiecki and Cowen are in the bottom half of the team. So over the course of 60 minutes of 4v5 penalty killing, Borowiecki will allow ~24 more shots attempts against than Marc Methot. The problem with the 2-74 pairing is neither of them are puck movers. How often have we seen them just dump the puck out giving possession right back to the other team? Inserting Chris Wideman to replace one of them is the easy suggestion right now. We’ve seen this happen when there’s been an injury to the defence with 2-45 being paired togethers, and in the limited sample size have certainly looked better than 2-74. I would guess 74-45 would also perform better than 2-74. Right now I’d be inclined to keep Cowen in over Borowiecki, as he should be the better player. Although, at this point, I’d support either being scratched to get Wideman in. The pairing of Patrick Wiercioch and Cody Ceci were a rock last season for this team, being a big part of that stretch run. Unfortunately thus far that hasn’t translated to this season. They’ve struggled as evident by their CF% together at 5v5 being <50%. 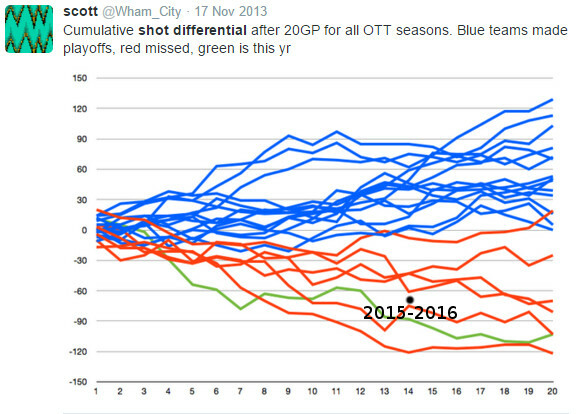 This is another reason for the team’s horrid shot differential so far this season. You can’t have both the second/third pairing struggling at the same time and expect to win many games. I’m willing to wait a bit more to see if they can bounce back. They deserve that after their performance together last season. There’s been a decent amount of criticism being levied towards Erik Karlsson this season. Ridiculous. He can certainly be better, we’ve seen it, but in no way is he playing bad. He’s been by far the best defenceman, making whichever pairing he’s been on better. He’s got 12 points (all assists) in 14 games, is averaging 2.36 shots per game, and playing 26:52 a game. It’s also hard to criticize his 0 goals when the powerplay setup isn’t designed for him to get shots off. He’s the least of the Sens problems. Analytics support 46-65 as historically being one of the Sens strongest pairings, and having Methot on the second pairing should certainly help. Although he hasn’t been lighting it up on the scoreboard, Shane Prince has not looked out of place on the top line with Kyle Turris and Mark Stone. They were easily the best line last night in Carolina. It’s only a matter of time before the points start coming for him. He’s looking better every game as he adjusts to the NHL. Unfortunately for Prince, it looks like he’ll have to slowly earn the trust of his coach ala Mike Hoffman. In the third period of last night’s game he found himself pulled off the top line in favour of Curtis Lazar who the coach views as a safer option. It was an understandable decision based on what we’ve seen with Hoffman, but in my opinion the wrong one. Prince was one of the best players that game (in fact, he ended the game with the best CF%) and the line was flying with him on it. Lazar on the other hand was struggling that night (ended with the worst CF%). It gets tiring seeing the team holed up in their own end in the finals minutes of a game instead of still trying to push for offence. One of the nice surprises this season has been the performance of Alex Chiasson. He started the season off slow, but the past few games he’s been noticeable in a good way. He was finally rewarded with a goal yesterday, and they should certainly keep coming if his play continues to stay the same. I don’t know what happened, but the first PP unit now consists of 9-7-93-6-65. Keeping both Hoffman and Stone off the first powerplay unit doesn’t make any sense to me. Speaking of Stone, his recent suspension only goes to show how much weight the NHL puts into the result of a hit to the head. If a player goes tumbling down on the ground you’ll have a much higher chance of getting suspended than if a player stays standing up (see Zetterberg on Pageau). In fact, this reminded me of a hit Eric Gryba laid on Lars Eller last season that certainly deserved a suspension, but Eller wasn’t even knocked down, so probably not even a second look. If you haven’t seen it yet, take a look at ESPN’s E:60 feature on Jonathan Pitre.